Students on the campus of the University of Massachusetts Amherst. 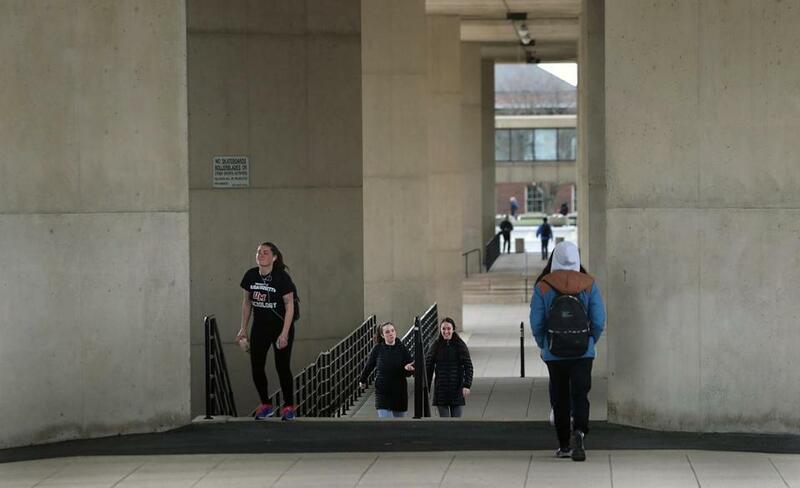 A longtime University of Massachusetts Amherst employee said Monday that he feels “stressed out” after an anonymous caller flagged him as an agitated black man on school property, prompting campus police to question him. The employee, Reginald Andrade, the university’s consumer manager for disability services, said Monday by phone that he entered Whitmore Administration Building around 7:45 a.m. Friday after his customary workout at a campus recreation center. Andrade carried his gym bag to his office and was later greeted by two plainclothes campus police detectives, who asked to speak with him. They rattled off several questions that seemed to come out of left field, he said. He said he showed the officers that his bag dropped down to his knees, contained only his clothes, and wasn’t “heavy at all.” In addition, Andrade said, he didn’t speak to anyone as he entered his building Friday. He credited the officers with questioning him in a professional manner and said he was later given a coffee mug and a keychain as “some sort of gift for my troubles.” Still, Andrade said, he “felt very uncomfortable” during the questioning and decided to speak to the media to raise “light and awareness” about racial profiling on campus. The Daily Collegian, the UMass Amherst student newspaper, first reported on the episode. Andrade said he keeps his school ID card with him at all times, since he was racially profiled twice before on campus, once in the 1980s when he was a student and again about four years ago, when he was leaving an office restroom in sweatpants after a weekend event. The chancellor said the message raised public safety concerns, based on the reported behavior, so police responded according to standard protocol. Officers determined after speaking with a man matching the caller’s description that there was no threat, according to Subbaswamy. Andrade identified himself as the man questioned by police. “But we also know that racial profiling, whether intentional or not, occurs and that it corrodes our efforts to ensure a welcoming living, learning and working environment for every member of our community,” Subbaswamy wrote. He said university police train regularly in threat response, profiling by proxy, and racial profiling, and Parham plans to speak to campus groups about the incident. In addition, Anna Branch, associate chancellor for diversity and inclusion, is available to discuss the matter with members of the campus community, Subbaswamy said. Friday’s incident at UMass Amherst came after a black student at Smith College, a private women’s college in nearby Northampton, was approached by a Smith officer over the summer after police received a report that the student seemed “out of place” while eating lunch on campus. Deirdre Fernandes of the Globe staff contributed to this report. Travis Andersen can be reached at travis.andersen@globe.com. Follow him on Twitter @TAGlobe.